Can you believe it’s almost Easter! It’s just a few days away, and I think this is the first Easter in years I haven’t bought a pretty new Easter dress shiny new white shoes. I’ve got to get on the ball. I don’t know what’s wrong with me, must be this rapidly growing baby in my belly. I only have one maternity dress from my first pregnancy that’s not solid black and of course, it’s black and white. And if there’s anytime to wear pretty pastel florals and stark white shoes, it’s Easter Sunday. But before I go dress shopping, I wanted to test out some recipes for Easter Sunday. For Easter dinner, we usually have the same thing. I think most families do. The traditional ham with lots of fresh spring vegetables and probably some potato salad. Oh, and don’t forget some fabulous citrusy dessert. I’ll be making a lemon something or other. Probably lemon meringue pie, it’s one of our favorites. Easter breakfast though is a meal that I’ve never put too much thought into. It’s usually just a nice weekend breakfast. But this year, I wanted to make something that was really pretty and just screamed spring, so this morning I tested out these little mini quiches. For these mini pies, I used Athens Fillo Dough. It’s such a versatile ingredient that makes a really pretty presentation. 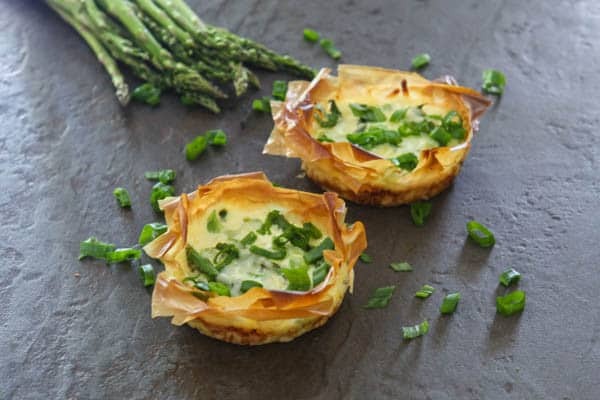 You could also make mini quiches and use their fillo cups. I like to use the sheets for this recipe though, so the quiche are a little larger. For the ingredients, I used fresh asparagus and green onions paired with Gruyere cheese. But if you don’t have Gruyere on hand, you could use any type of mild cheese. I made half of these with mozzarella cheese and they were just as good. After filling the mini quiche with vegetables and cheese, I pour in the filling. For the best filling, use cream. It tastes amazing, but it’s fatty. I like to compromise with half and half, but you could also use whole milk. Using a lower fat milk doesn’t make a very good filling, although you could if you are really watching you’re fat intake. The great thing about making individual quiches is that you can tailor each quiche to each family member’s own unique tastes. So if one of your kids hates asparagus, just add green peas to his or hers, or whatever vegetables you like. Feel free to add meat to these too. Chopped bacon makes everything better! To bake these quiche, I used a mini pie baking pan. You can also use mini pie plates or a cupcake tin. All work equally as well. Heat oven to 350°. Spray mini pie pans with nonstick cooking spray or brush with butter or olive oil. Line pie plates with one sheet of fillo dough and then brush or spray a layer of oil or butter. Continue this process, using 3 - 4 sheets of fillo dough. Place chopped asparagus and green onions in each pie plate. In a medium bowl, combine eggs, milk, cream or half and half with a little nutmeg and salt and pepper. Whisk well to combine. Sprinkle cheese over vegetables. Pour egg mixture in each pie plate. You may have filling leftover. Bake 15 - 20 minutes, or until egg mixture is set. 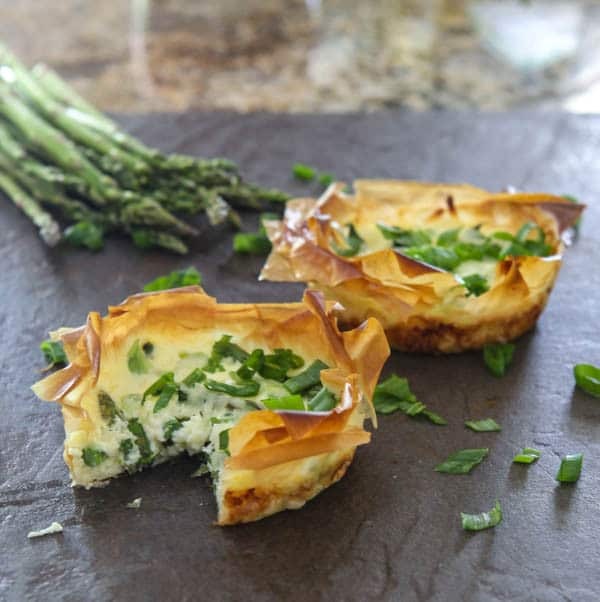 We always have Athens phyllo dough and shells on hand…they’re great for last-minute appetizers. I love the nuttiness of the Gruyere with the fresh veggies in these quiches. What a beautiful recipe! Perfect for a holiday brunch! I can’t believe Easter is already here! This is perfect for Easter!! These are perfect for Easter breakfast! I haven’t put much thought into our easter breakfast! I’m totally running behind as normal! Perfect brunchy bites! I wish I would have put this much thought into Easter breakfast. I planned dinner and dessert but totally spaced on breakfast. Oops! I love finding new ways to work more asparagus into our diets. 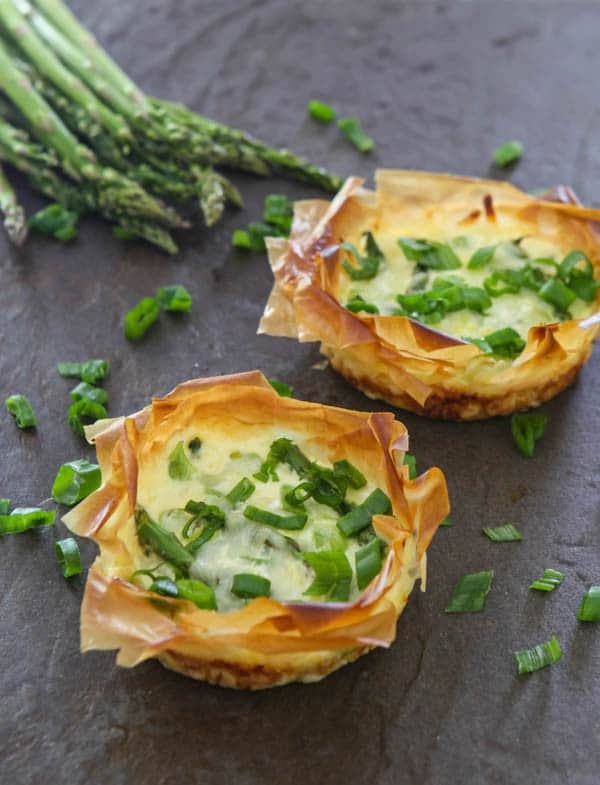 I haven’t used phyllo dough too much but now I want to because these look amazing! These are so pretty. I can totally see making a bunch of these and each person can customize their own. Such a cool idea.